On June 14, OnePlus will unveil the OnePlus 3 through a virtual reality portal called The Loop. On that same day, you will be able to order the phone in VR during an exclusive time period before sales open on OnePlus’ website. But what if you aren’t into buying phones the day they are released before seeing reviews or getting your hands on them? OnePlus has a solution for a select few of you in the form of a pop-up shop tour. 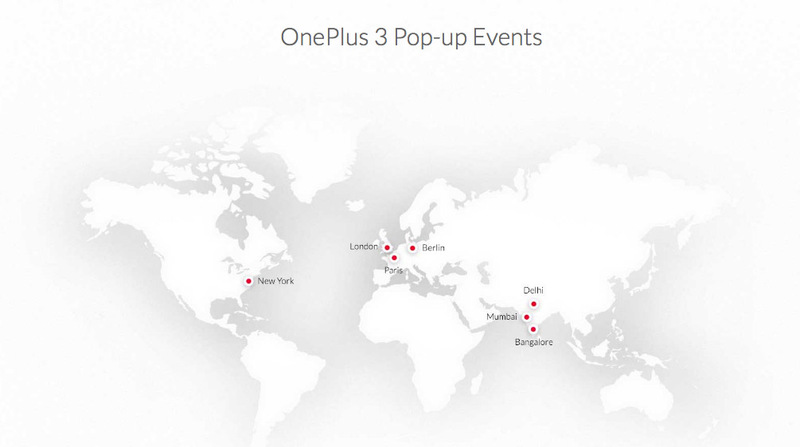 OnePlus will host pop-up events starting June 15 across the globe to help you get your hands on the OnePlus 3. The pop-up event tour will run through New York, London, Paris, and Berlin on the 15th, giving OnePlus fans a chance to win free swag, play with the phone, and even purchase the 3 “right then and there “. Shortly thereafter, pop-up events will happen in Mumbai, Delhi, and Bangalore. The New York event will take place at Magnum New York (map link) on the 15th from 7PM-10PM Eastern. Carl Pei, one of the company’s founders, will be in attendance as a special attendee. For more details on the exact time and location of each pop-up event, hit up that source link below.